Ever since Serena William’s long spell of dominance in women’s tennis ended, it has been difficult to predict who will win Grand Slam titles. Many talented players have filled the void left by the American, but none of them have even come close to establishing a stranglehold at the top of the game. And the fact is that there are so many excellent players around that it the WTA tour has become an almost ever-changing landscape where as many as 20 or 30 women are potential winners of every event. Because of this, none of the top players can ever relax or have a bad day. If they do, they usually lose, and it has never been better illustrated than at Wimbledon 2018. Sloane Stephens is the 2017 US Open champion and a high-class tennis player. However, she arrived in London three days before Wimbledon started having not practiced on grass at all. When you consider that woefully inadequate preparation, her straight-sets loss to Donna Vekic in the first round suddenly seems unsurprising. Simona Halep achieved her life-long goal of winning a Grand Slam tournament in Paris last month. That success followed good runs to the final in Rome and the quarter-final in Madrid. It is nothing new for a professional tennis player to be in pain as they have a punishing schedule. However, it seems entirely possible that Halep’s motivation was not as strong as usual because she recently fulfilled her biggest ambition. That probably made her less inclined to play on through the pain and, whether she was aware of it or not, it probably also dulled her competitive spirit a bit. And we all know small margins can be crucial in top-level sport. Madison Keys is a very different case. When she walked out onto Court 12 to face Evgeniya Rodina in the third round, everything was set up for her to go on and claim her first Grand Slam title. Seeds were tumbling all around her, she had a chance to take an under-cooked Serena in the fourth round and she loves playing on grass. Bizarrely, the sense of opportunity seems to be what got the better of the American. “I wasn’t thinking about my match right now in that moment,” Keys said after her shock loss. On the plus side, Keys now knows what she has to do to try and prevent a repeat and she is willing to do it. It is so much easier to be a man in tennis because you are very unlikely to face a player of the calibre of Ekaterina Makarova in the second round of a major. The Russian was once the World No.8 and has reached two Grand Slam semi-finals. She has a lot of tennis ability and she showed plenty of it in her win over Caroline Wozniacki. Sometimes it is that simple, and something similar happened to Petra Kvitova. 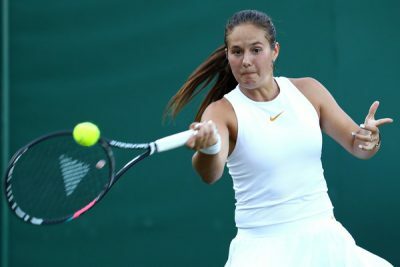 The Czech, who was the favourite for the event after glory in Birmingham, lost to Aliaksandra Sasnovich, who turned up on Centre Court feeling inspired and suddenly produced the best tennis of her career. Garbine Muguruza will surely sympathise with Kvitova and Wozniacki. She lost to Alison Van Uytvanck, who has never been inside the World’s Top 40 but played like a Top 20 player. Importantly, all three of these giant-killers have backed up their famous wins and are now preparing for fourth-round matches. This demonstrates they have the ability to be successful – they just need to learn to produce it more frequently. Caroline Garcia received possibly the most difficult unseeded first-round opponent of all: Belinda Bencic. The Swiss player reached World No.7 before a series of injuries got in the way of her career, but she looks to be on the way back now. Bencic looked sharp against Garcia and, although the Spaniard could have played better, sometimes players just have to accept that they have been outplayed. Venus Williams’ defeat is probably the most understandable as she lost to 20th seed Kiki Bertens. It was a very close match that the Dutchwoman just about shaded – and hardly an upset at all. There is another key reason why Stephens lost early at Wimbledon. Her first round opponent, Donna Vekic, is arguably one of the most talented young players on tour and, crucially, she loves grass. The Croatian reached the final in Birmingham when she was just 16 and then won the event in Nottingham in 2017, before backing that result up with a run to the last eight this year. Vekic is also a more mature player now. Where she once tried to hit winners from the baseline all the time, she now constructs points intelligently and is willing to defend and wait for the right moment to attack. Like Makarova, Sasnovich and Van Uytvanck, the World No.55 has backed up her big win by making it to the fourth round. And she is definitely capable of beating last-16 opponent Julia Goerges, so she could go deep into the tournament this year. Although she reached the fourth round last year, no-one talks much about Elina Svitolina as a contender for Wimbledon. That is because the Ukrainian still looks uncomfortable on grass. She thrives on hard courts and clay courts where the bounce is predictable, but often looks lost when she ball skids low at venues like Birmingham. This year, Svitolina was handed a tricky first-round tie with Mallorca winner Tatjana Maria. She competed well in the first two sets, which were shared, but fell apart in the decider against an opponent who played more consistently on the day. However, it is unlikely that those who watch the last-16 matches at Wimbledon this year will be disappointed with what they see as there are exciting match-ups everywhere. In the top half of the draw, Halep’s unpredictable conqueror Hsieh takes on fearsome fighter Dominika Cibulkova, big-hitting 2017 French Open champion Jelena Ostapenko faces Sasnovich, endlessly-inventive Daria Kasatkina meets Van Uytvanck and two-time Grand Slam winner Angelique Kerber plays against Bencic. In the bottom half of the draw, highest-seed-remaining Karolina Pliskova continues her quest for her first Grand Slam title against Bertens, big-server Goerges faces Vekic and aggressive Italian Camila Giorgi takes on Makarova. All of which leaves just one match that is likely to be boring: Serena versus Rodina. The Russian is the World No.120 and should have been thrashed by Keys, so the 23-time Grand Slam champion will be expected to succeed where her fellow American failed.